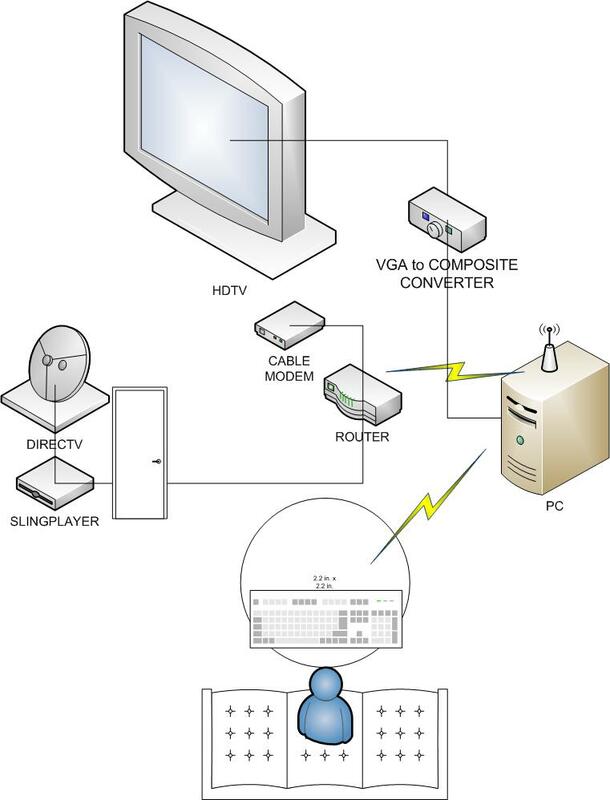 In case that’s not clear, my PC connects to the Slingplayer and streams video to my TV using a VGA-to-composite converter (which is sadly SD on my HDTV.) For all of the inputs on my HDTV, I didn’t have any that had the same sync rates as the PC I was using to generate video, and the PC was so old that I couldn’t successfully add an HDMI card to it. Of course, the system now needed a remote control, a role that was ably-filled by a wireless keyboard and mouse. As you may well imagine, everyone other than me found this system incredibly confusing and I basically had to come into the living room anytime anyone wanted to change the channel. I finally gave in and got cable last year, and I now have a fairly standard setup with a set-top box connected to my TV, but no capability to stream video from my PC to the TV. Those are the simple and obvious applications – 5G WiFi eliminates the most-complicated parts of my Rube Goldberg A/V setup. But it also enables Wi-Fi Display from my smartphone – I can stream a movie or a video game from my phone directly to my TV. 5G WiFi has three times the throughput of my 802.11n wireless router, so I can stream high-quality video and do something else simultaneously with my phone – use the internet, stream audio, you name it. As I mentioned in my last piece, I like to try to come up with technology that my mom would find useful. Not only would my mom find the 5G WiFi TV, smartphone remote and 5G WiFi Display really cool, she’d be really excited that it got rid of all of the clutter (keyboard, mouse, extra computer) that I had in my living room. In the first part of this series, I talked about how the 2.4 GHz band is not very conducive to reliable Wi-Fi. In this part, I will talk about the 5G WiFi’s interference avoidance benefits. 5G WiFi operates in a much cleaner, wider swathe of radio spectrum. 5G WiFi is therefore devoid of any interference from microwave ovens or cordless phones. Besides, the wider spectrum implies that neighboring Wi-Fi networks need not share the air waves as in the 2.4 GHz band. Clearly, the 2.4 GHz pain-points are addressed by 5G WiFi. Now, 5G WiFi not only works in a different swathe of spectrum, but is also backward compatible with all your other existing Wi-Fi devices that works in 2.4 GHz. So, if your access point and your TV have 5G WiFi, then you get the benefits of this cleaner, wider spectrum. However, if one of your devices does not support 5G WiFi, don’t worry! That device will still work with other 5G WiFi devices in your network. It will, however, not benefit from the 5G WiFi goodness. In summary, 5G WiFi elegantly addresses the interference problems with current Wi-Fi networks. It is, at the same time, completely interoperable with existing Wi-Fi devices. So, if you are considering an upgrade of your Wi-Fi access point or buying a PC/laptop in the second half of this year, there is only upside in going for a 5G WiFi device. You get blazing speeds, and the cleaner air results in much better coverage & reliability. In this two part series, I will attempt to make a case for 5G WiFi. The first part talks to the challenge that the exploding amount of media content poses for current Wi-Fi. For the past few years Wi-Fi has grown on us. We have been using Wi-Fi for emails, instant messengers, browsing the web for information, news, on-line shopping, uploading/downloading pictures etc. And now we have begun to use a lot more of Wi-Fi for sharing our personal videos with family and friends, on-line gaming, watching sneak previews of movies on YouTube, streaming movies and favorite shows from Netflix and watching our favorite sporting events from anywhere in the world over the internet. In fact, video/real-time media content consumption forms the majority of the internet traffic today, and this category of traffic is becoming increasingly wireless in-home and is only growing faster all around the world. Wi-Fi has thus enabled us to watch internet content on any and possibly every display screen at homes and enterprises. Wi-Fi has also enabled productivity gains by providing mobile network connectivity to various gadgets. Thus devices such as PCs, smart phones, tablets, TVs, home theaters, Blu-Ray Disc players, set top boxes, cameras, gaming consoles are all becoming Wi-Fi enabled today. Further, Wi-Fi will be in more gadgets, appliances and ‘things’ we come to use in our day to day lives such as cameras, cars, washers/dryers, in-home security systems etc. to name a few. As the appetite for content-rich internet media consumption and distribution in the home and enterprise grows, the question of adequacy of the current networks for delivering a quality video stream without compromise of the mobility experience remains. Further, with more networked Wi-Fi devices than people in the homes today, the question of bandwidth availability also arises. In the next part of this series, I will make the case for 5G WiFi given this media and device explosion challenge. 5G WiFi – why call it that? 5G WiFi is the moniker for IEEE 802.11ac based Wi-Fi solutions. So, why 5G WiFi? 802.11ac is the 5th generation of Wi-Fi! Wi-Fi as a technology has come a long way from the 2 Megabits per second [Mbps] speeds that it offered way back in 1997. Since then, it has revolutionized the way people use their computers, popularized laptops and mobile devices, and opened up the internet to every corner of the world. What is more, Wi-Fi as a technology has also continually improved in speeds and reliability with every new generation. Essentially, it has fostered the mobile computing revolution, and stepped up every single time to meet the increasing wireless needs of the consumers. Therein lies the unique success of Wi-Fi over the years. As we enter 2012, we introduce 5G WiFi, the 5th generation of Wi-Fi – aptly named to recognize the impact Wi-Fi will continue to have on us in the years ahead. 5G WiFi recognizes the fact that each previous generation has come in at the right time to address an inflection point in consumer needs. The 1st generation Wi-Fi, 802.11, was introduced in 1997 for wireless internet. As emails became more prevalent, the industry quickly productized the second generation of Wi-Fi (802.11b) in 1999. In 2002, as the web experience became richer & graphics intensive, 802.11g/a stepped up as Gen3 Wi-Fi. The popularity of internet video sites like YouTube simply meant that it was time for the much faster 802.11n to take the mantle of 4G WiFi! And 5G WiFi is no different – it is here as a panacea for the video challenge. We need 5G WiFi to help the increasing number of Wi-Fi enabled devices access all the rich media content available on and off the web. 5G WiFi also reminds us that Wi-Fi will continue to serve us all for many years to come. It represents the continual industry commitment to meet your every single wireless need at home and at work. Today, with 5G WiFi, it is all about media content and devices. The possibilities for tomorrow are unlimited. And history suggests that Wi-Fi will keep up – with 6G WiFi and more. So, join us in welcoming the 5th generation of Wi-Fi as 2012 dawns on us! Why a 5G WiFi Blog? 5G WiFi is an exciting new technological development. The Broadcom WiFi team truly believes that it will revolutionize the way people access their digital content wireless among other things. As a leading WiFi solutions provider, our entire team also felt the need to share this excitement with everyone! And what better means to shout out to every nook-and-corner of the world than a blog that brings you real-time updates about the state-of-the-art in WiFi. Our objective is to make the 5G WiFi website, and this blog as the only stops you will ever have to take for anything on 802.11ac – the 5th generation of Wi-Fi. As the blog rolls out, we will strive to answer several aspects of this wireless standard for readers with different interests. We are hoping that the blog will cater to engineers and marketing teams in the technology industry, journalists/bloggers, IT planners for enterprises, and the general consumer. We want you to be able to look up this site for WiFi technology and product information before you want to buy a new wireless router, smart phone, tablet, PC, TV or other consumer electronics goods for your home and offices. On a personal note, I am a believer in “Impact through Information”. I want this blog to help my mother happily head to the store and get herself a 5G WiFi product. If I can make her understand that 5G WiFi will improve her Skype experience with me, or that she can now download our family videos on to her PC and watch it seamlessly on her wireless television. To that end, I am determined to peel the layers of technology jargon and make 5G WiFi palatable to her and to all of you. So, welcome to the 5G WiFi blog! Hope we are able to rub some of our excitement on you! Please feel free to reach out to us with questions and suggestions. Your questions will also help us create content that is useful for other readers as well.